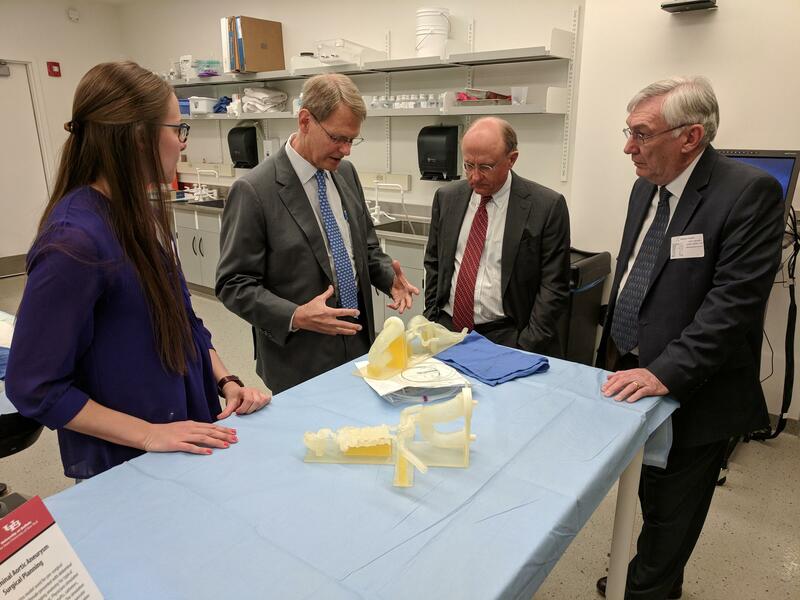 Jacobs Institute Founder and Chief Scientific Officer Dr. Nick Hopkins (second from left) explains the use of 3D-printed models in the planning of complex vascular surgeries. Inside the modern glass walls of the Jacobs Institute on Ellicott Street, medical device developers have a space to partner with colleagues from research and medicine. Known as the Idea to Reality Center, or i2R, the space is the latest major step in the vision of Jacobs Institute Founder and Chief Scientific Officer Dr. Nick Hopkins. That’s not a problem for the i2R. 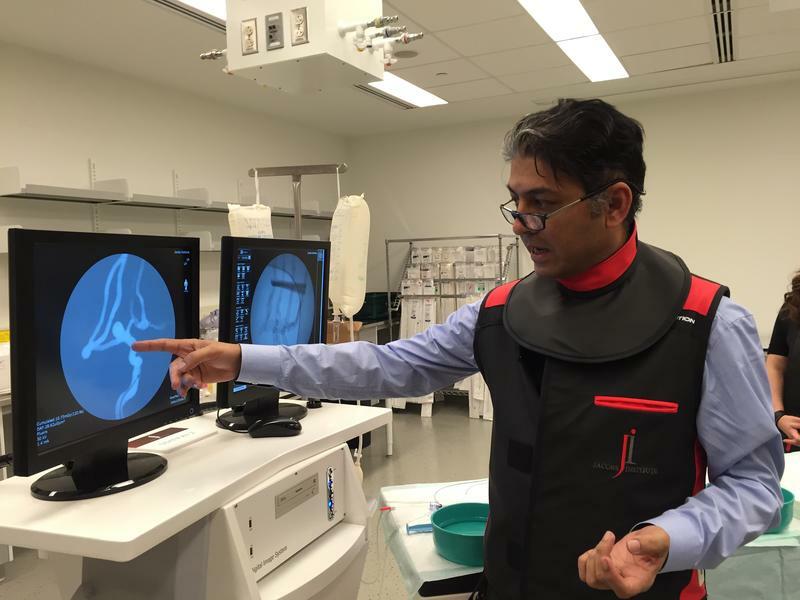 With its home in the Jacobs Institute physically sandwiched between university researchers in the floors above, and hospital clinicians in the floors below, developers have immediate access like nowhere else in the world. Experts can help navigate regulatory hurdles or answer engineering questions, provide experience-based feedback and real-world application, or just analyze data – all in one space. Hopkins reiterated that the intention of his original concept, started in 2013, and the building’s design is about collisions between people in departments and fields that are traditionally kept in separate silos. East Aurora-based design firm Moog, Inc. is one of the i2R’s first project partners, working on simulators for eye and dental surgery. For its Chief Technology Officer, George Small, the model of success is about more than just the physical layout of the building and the people who are there – it’s about the kind of working relationships that are being encouraged. Small said the Jacobs Institute has worked hard to develop a learning process that is supported by collaboration, and allows for the appropriate use of what he calls a “fail fast” mentality. And speed is what the i2R is also about. The traditional silos Hopkins pointed out come with a slow and distanced approach. A medical device developer with an idea may be in one city and have to reach out to researchers and clinicians in another city across the country or an ocean to have it tested and commercialized. Eliminating the space between means eliminating significant time. i2R, in partnership with companies based both locally and elsewhere, will work to provide incentives for companies to bring their projects to Buffalo and, hopefully, stay in the medical corridor.